Recently, a young mother asked me if I thought reading stories to her 3-year-old on her tablet was storytime or screen-time. Good question, since the American Academy of Pediatrics advises that parents read to their children beginning at birth, but they also recommend no screen time for children under 2 and less than two hours a day of screen time for older children. As librarians, you’ve probably been asked this question as well by parents and caregivers. Those of us who grew up with traditional picture books — that wonderful feel of the pages between our fingers, text and illustrations that you can touch, the joy of flipping pages back to revisit an illustration — are sometimes left a bit bewildered by the transition to digital picture books. Yet, in this busy, fast-paced world of families today, the idea that young children could have a virtual library of hundreds of beautiful books available to them at the touch of a few buttons is exciting to imagine. Research continues to demonstrate that reading aloud with young children is the single most important way to create a love of books and to support later learning and school success, yet only about 51% of families read aloud daily to their young children. Digital books provide book access, one of the essential elements to support reading aloud at home. Pediatricians recommend reading to children right from the start. For a baby, the read-aloud experience centers on connecting with a loving adult through language and warm, responsive interactions. Flipping the pages of a book back and forth, hearing your voice, watching as a loved one points to illustrations, and putting their own sticky fingers and sometimes mouths on the same spot, are all part of sharing a book with a baby. Babies simply can’t have that experience with an e-reader. They might be very interested in watching the screen, but they will miss out on the rich, multisensory experience of sharing a traditional book. For older babies, toddlers and preschoolers, the ideal read-aloud experience is one that sparks curiosity and conversation. How that experience changes with digital picture books depends on a few things. Digital picture books are often enhanced with music, animation and games. They are definitely engaging to young children, but with all this interactive fun, sometimes the actual story gets lost. 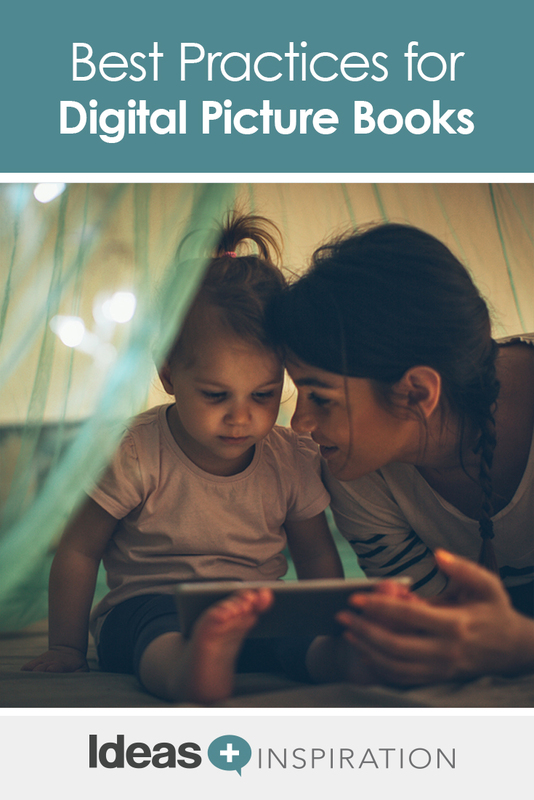 Research shows that there is much less adult-child interaction and conversation with e-books, so much of the read-aloud benefit is also lost, and children spend more time on “making the book work” then settling in and enjoying the experience. There is no denying the convenience of e-readers and the fact that these devices offer access to hundreds of books at home or while families are traveling. But the benefit to children increases with the use of high quality e-resources and guidance in using them. Our local library, Tompkins County Public Library in Ithaca, NY, subscribes to Tumble Books, an excellent resource that offers a variety of user options for digital picture books that stay true to the story. Include a page on your website providing insight and support about sharing e-books with young children. Hold a parent workshop to help families explore access to digital materials and understand the ideal way to guide their use with their children. Post signage in your children’s area that explains best practices for using digital materials with children. Share best practices during storytime with parents and caregivers. Turn off the narration. Especially during the first few times with a new digital book, read the book in your own voice, pause, ask questions and fully engage in the wonderful parent-child conversation that makes the read-aloud experience so rich for young children. Just as with traditional books, children will learn to “read” them independently. Encourage them to do this without the narration and to tell the story as they remember it by looking at the pictures. Use the manual instead of auto setting. This allows you and your child to move through the book at a comfortable pace and to turn back a page or two whenever your child wants to. The convenience and novelty of e-readers for young children can provide entertainment and access to a huge collection of books. It’s crucial to remember, however, that it’s an adult who can help make this experience more complete by adding a warm lap and lots of conversation. For more ideas about sharing books with babies, visit our website, www.familyreading.org. Through 14 unique programs we are striving to create a culture of literacy in our community in which all children have early, frequent and pleasurable experiences with words and books right from the start. One of our newest initiatives, “Every Baby, Every Day. Talk. Sing. Read. Play,” is a call to action, focusing on babies in their first few years. 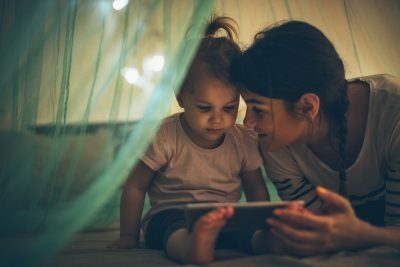 We have created many downloadable resources designed to support families in understanding the importance of language, playful interaction and books as the way to set the stage for their babies and young children to enjoy a lifetime of learning and, more importantly, a lifelong connection to the joy of books! Elizabeth Stilwell, MEd in Leadership & Policy in Early Care and Education, has 25 years experience as a faculty member at Cornell University, early childhood educator, trainer, staff developer and Child Care Center Director. She is currently working with Family Reading Partnership, a nationally recognized community literacy organization, as Early Childhood Specialist, supporting initiatives to ensure that every child has frequent and joyful experiences with language and books right from the start.